When is the best month to go Hokkaido? Depend on preferences. If you plan to snow ski, obviously winter season is the time to go. The coldest period is between mid January to mid February. 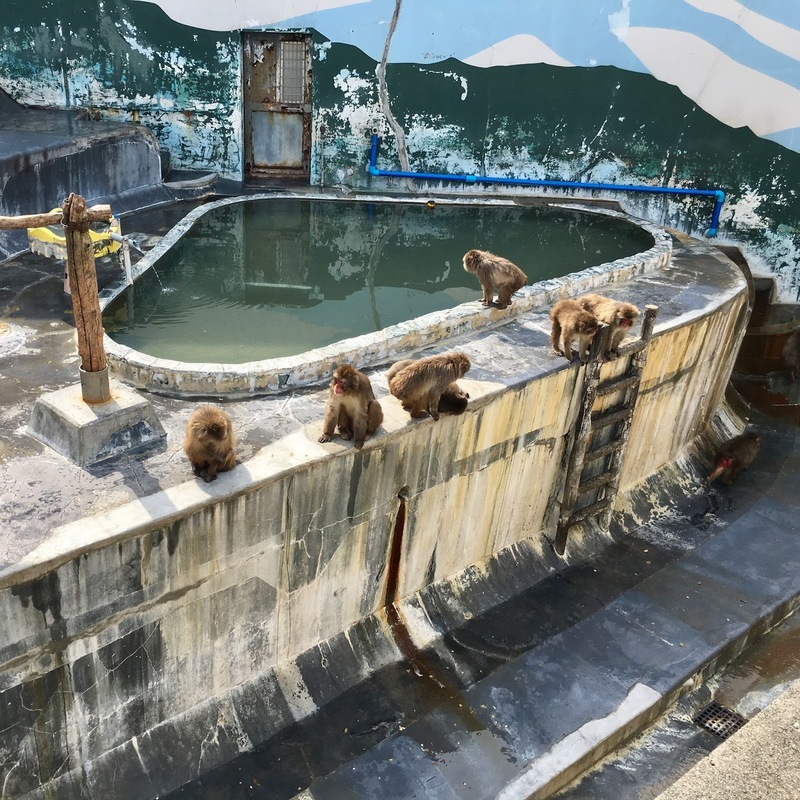 Activities such as winter festivals, cruise ride (iceberg) and watching monkeys enjoy hot spring are some of the highlights during winter. Due to dangerous road condition during winter, self-drive road trip is strongly discouraged. All other seasons such as autumn, self-drive road trip may be the best option. Hokkaido road is excellent to drive (other than winter). If you are planning for a road trip in Hokkaido, following article gives you some ideas what you can do during the autumn. (f) Hokkaido road conditions and infrastructures are excellent. Japanese drivers are gracious and safety conscious. What you need to rent a car and drive in Japan? A 7 to 9 days Hokkaido holidays organized by tour agencies easily cost between $3,500 to $4,500 per person. The prices usually exclude optional activities and food in some days. The actual time spend on "real" tour activities (other than visit shops that no locals will patronize) are lesser too. On the other hand, a 9 days self-drive Hokkaido road trip only cost approximately $2,600 per person (all-in). It includes airfares, hotels, car rentals, gas, toll, food, shopping, contingencies and all attraction entry fees. Read on if you think self-service road trip is for you. 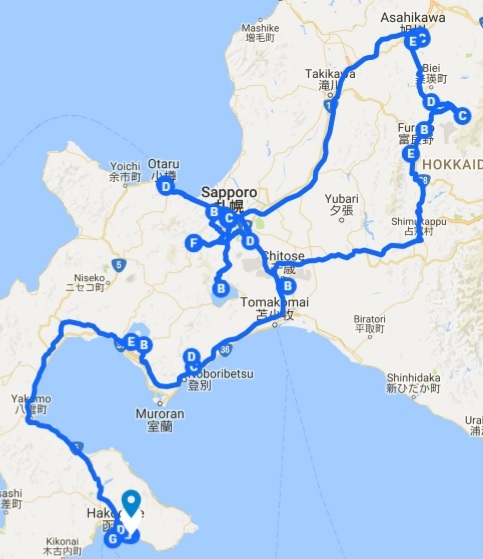 How should I budget Hokkaido Self-Drive Road Trip? Total cost for 3 adults was $7,633, worked out to be only $2,544 per person. We did not include travel insurance because we were covered by yearly worldwide travel insurance plan. If you include travel insurance cost, it only add another $230 (family of 3) to the budget. The big ticket items are airfares and hotels (Table). Total cost can be reduced by opting for budget airlines and cheaper hotels. Depends on family size, I would recommend small car for 2-3 adults, mid-size car for 4 adults, and bigger car for 5 or more adults. Japan is a 'mini' country, meaning most things they built are mini size. Rooms, toilets, carpark and road are relatively small. Given a choice, a small 4WD car is all you need. Most roads speed limit between 40km/hr to 50km/hr. Highway speed limit 80km/hr but most cars travel around 110-120km/hr. 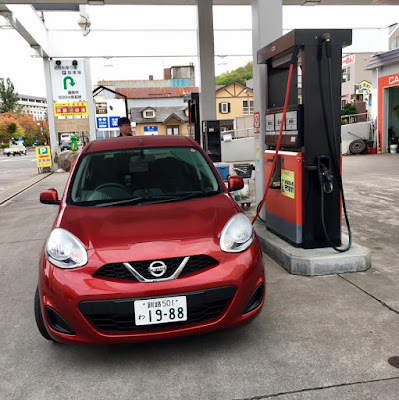 My preferred choice is fuel efficient auto-gear 4WD Nissan March. Powerful enough to carry 3 adults, 3 large luggage and many smaller bags. It traveled 120km/hr on highway and climb mountains with ease. The car is fuel efficient, cost only $67.74 for the whole 9 days road trip. The car is spacious and easy to maneuver. 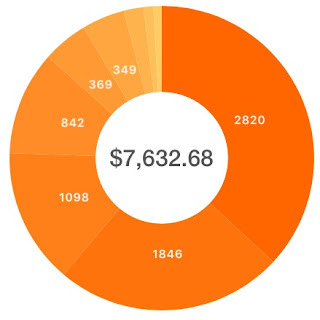 Nine days car rental including comprehensive insurance (zero access) cost $842.42, which translates into $93.60 per day. We used Times Car Rental, booked online via Tabirai Japan. What other considerations when self-drive? Get an International Driving License from AA Singapore and bring along your Singapore driving license. You need both licenses for car rental and drive on Japan roads. I suggest a backup driver for contingency purpose. Since most of us don't understand Japanese, GPS is a must to move around Japan. Forget about English GPS provided by car rental companies, most search functions and road names had limited English names and required Japanese input. We recommend good mobile data plan and Google Map. We bought $45 pre-paid 7.5GB data SIM card (15 days validity) from JTB at Takashimaya. More than enough to post photos on Facebook, WhatsApp and used Google Map for the whole trip. We bought another $35 pre-paid 3GB data SIM card (9 days validity) for my son, and used hot-spot for my wife mobile phone. Gas stations readily available all over Hokkaido. Regular fuel cost about $1.65 per litre, relatively cheap compared to Singapore. Gas stations accept both credit cards and cash. At times, you need pump attendants help, as the instruction and signage were confusing to someone who knew nothing about Japanese. All pump attendants were exceptionally helpful and courteous. Very impressed by their service level. If you have time to burn and unwilling to spend more money, avoid highway as the toll could be expensive. Personally, I preferred the convenience and peace of mind that highway provides. The highest highway toll we paid was a 3 hours drive from Hell Valley to Furano, which cost about $50. In general, highway toll ranges from $10 to $45 depending on distance traveled and locations. The local usually use ETC card to drive pass the toll gate, similar to our ERP system. For tourists like us, pick up the ticket at the start of toll gate and pay cash (to the staff) at the end of toll gate. In some sections, you paid cash directly to the highway staff at the beginning of the toll gate before the journey. Hotels in sub-urban usually provides free parking, while those located at city centre usually charged a fee for overnight parking. Hotel parking fee usually allowed multiple entries within the same day. It could range from $10 to $18 per day. Public parking cost about $1.35 for 30mins, depending on location. Some elevator type of car parks only accommodate small cars with 1.55m height limit. We recommend the following travel plan - pretty spot on and within budget. We flew Japan Airline, very impressed with the service on board. Seats were more spacious than SIA, and Japanese bento meal was awesome. Luggage check-in (max 23kg per passenger) and collection were fast and hassle free. Transferred at Tokyo Haneda Airport to Hakodate. Arrived at Hakodate Airport around 9.10am. Check-in pre-booked Times Car Rental at the airport. 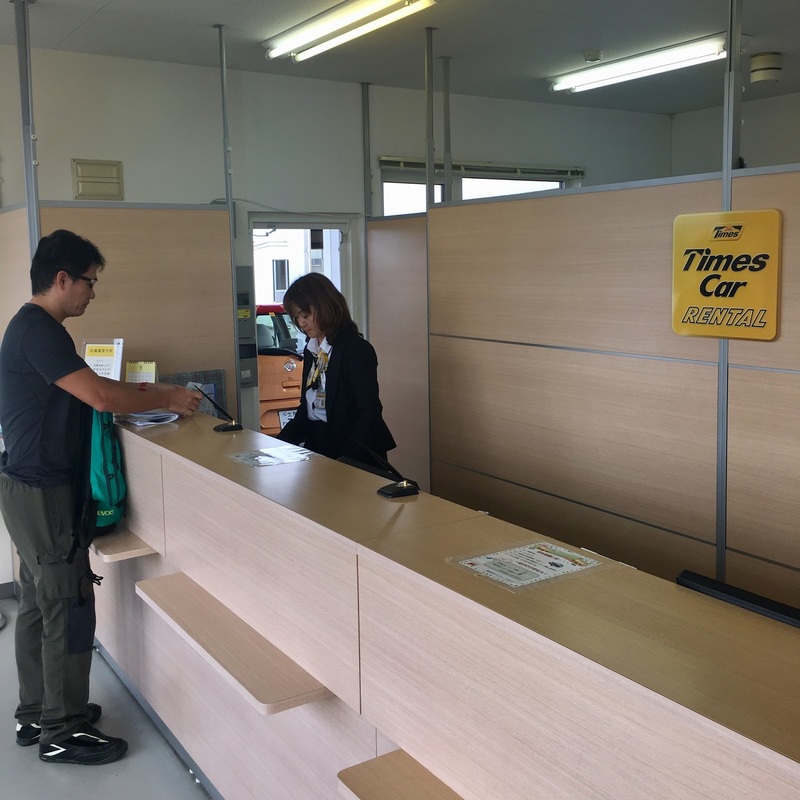 The staff from Car Times Rental ferried us via bus to their office to pick up the rental car. All settled and ready to start our road trip at 10.30am. Everything ran according to plan. Thanks to the efficiency of the Japanese. Once we pick up the car at around 10.30am, we drove straight to the Tropical Botanical Garden to watch the infamous monkeys. Just a 10 minutes drive from the airport, and free parking at the entrance. 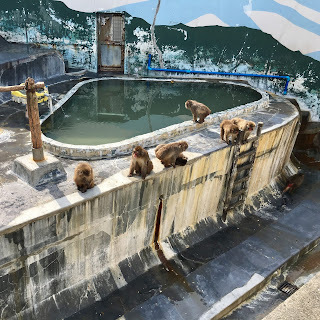 Unfortunately, the monkeys only dipped into the hot spring during winter. We only saw monkeys lazing around the captivity. Entry fee around $5 per person. A mini-size Garden by the Bay (green house) and a kid's pool located just next to the Monkeys captivity. We spent about one hour at the Tropical Botanical Garden, and proceed to the city centre for lunch. Did some research about best food in Hakodate, and was surprised beef burger came in top of the list. The recommended burger restaurant was located at 23-18 Suehirocho, Hakodate 040-0053. Found out later it was a chain burger restaurants. The burgers were pretty good, "real' Hokkaido beef patty and generous fresh lettuce. The most popular dish was cheese fries. Prices similar to conventional burger chains in Singapore. After lunch, we shop at the old warehouse converted mall along the canal and seaside. The temptation of Japanese snacks and ice cream were too hard to resist. Went for another round of food trails in the afternoon. After having a good doze of shopping and snacking, we drove about 5 minutes to Hotel Hakodateyam and check-in around 3pm. Settled down, refreshed and took a good rest after the long flight and short tour. Dinner time, we drove 5 minutes to town area for Ramen at Ajisai (Kurenai 12-7 Toyokawacho). Our first Ramen since landed in Japan. The standard was ok, price about the same as Singapore. 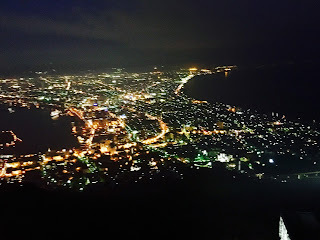 After dinner, we went back to hotel and walked over to Motomachi Ropeway for our last stop of the day, Mount Hakodate. 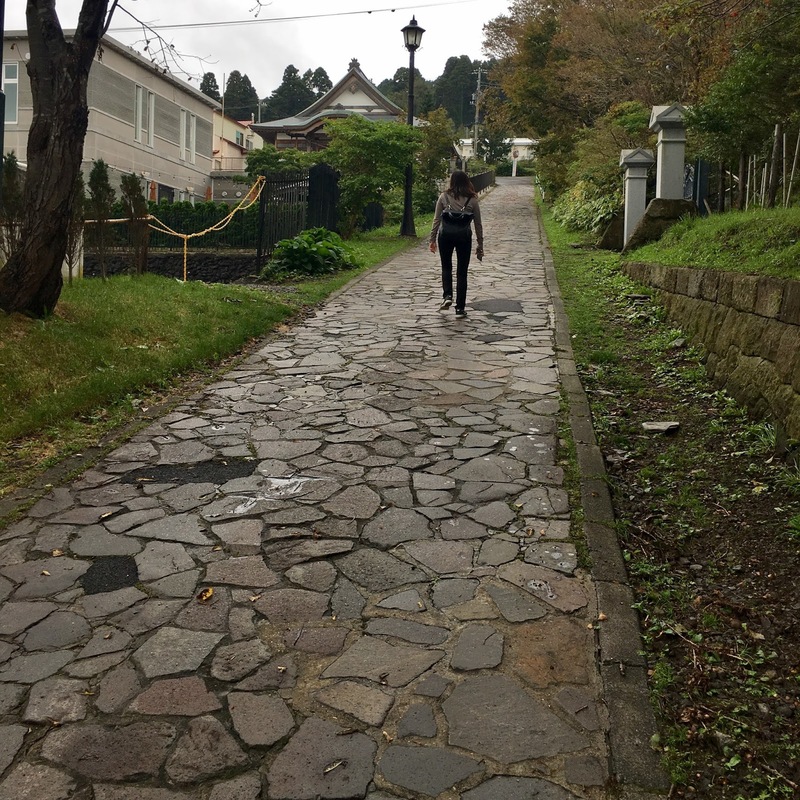 15 minutes walk from the hotel to Motomachi Ropeway. The cable car fee approximately $16 per person. The night view was spectacular but the experience could be better. The cable car and mountain top were congested with bus loads of local and overseas tourists. Did not stay long at the top, decided to return next morning to experience day view. 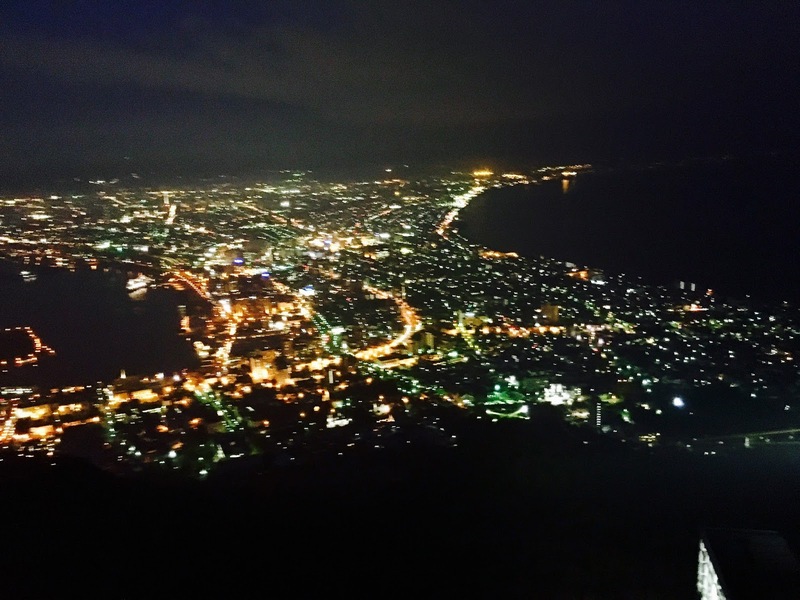 Mount Hakodate can be accessed by car during day time, but closed for private cars during the night. The only ways to go up at night was by cable car, taxi or bus. Had our breakfast in the hotel and took a stroll to the Hakodate Russian Orthodox Church. 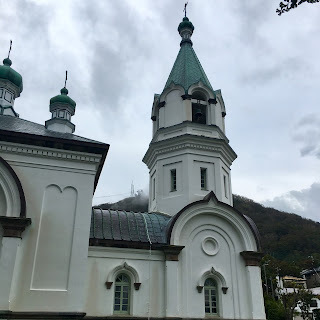 Along the way, we enjoyed the greenery, old architectural houses and churches. 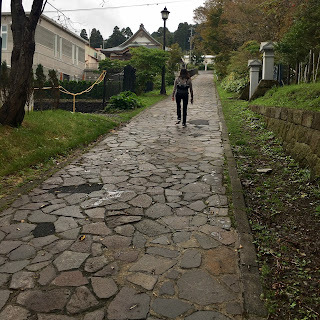 Japanese students rode bicycles to schools and old folks walked the dogs along the greenery street. Peaceful and therapeutic. 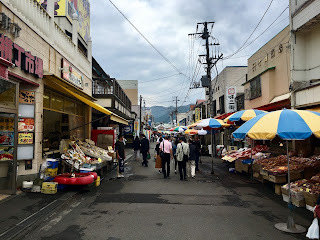 Hakodate Morning Market, one of the highlights in our road trip. Just 10 minutes drive from the hotel. Most of the shops in the morning market sell the same items, and prices were quite similar. You pick the live seafood (E.g. Giant crabs) and get them to cook on the spot. Prices include cooking. 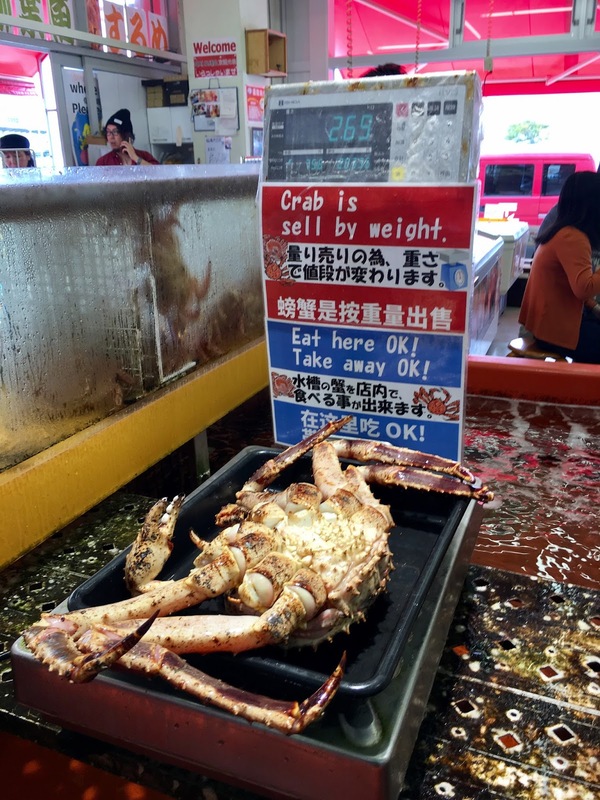 The Giant Crab cost $100 per kg. 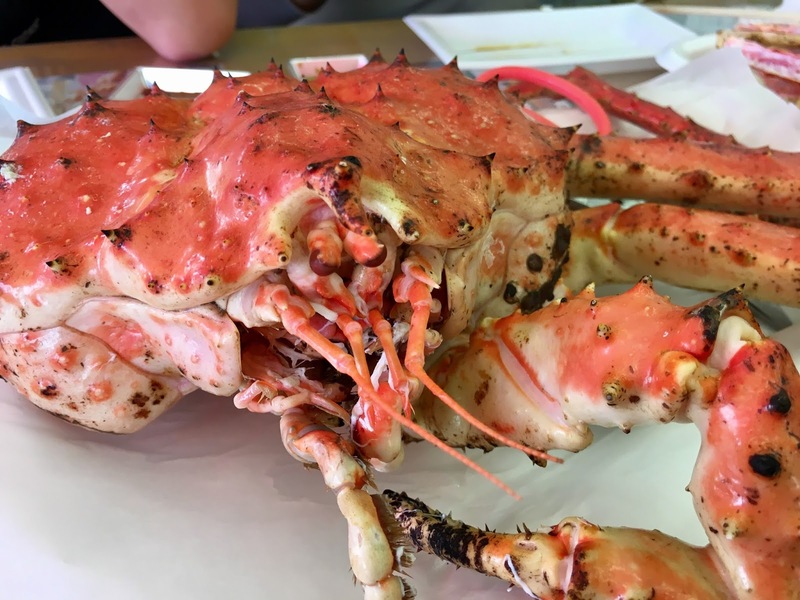 A medium size crab weigh approximately 2.5kg and cost around $250. Many ways to eat the crab: raw, steam and barbecue. We bought a 2.69kg medium size crab and asked the chef to cook all 3 styles. The bulk of our food budget went into this giant crab, worth every single cent. The Japanese did not like to bargain, especially the older folks. Continue our journey, drove 20 minutes from Hakodate Morning Market to Fort Goryokaku. Public car park (chargeable) is just 10 minutes walk to the fort entrance. Fort Goryokaku was designed by Takeda Ayasaburo in 1855. The designer copied the star-shape design from French, to improve combat superiority over the enemies. The fort was built to protect the Tsugaru Strait against potential invasion by the Russians. Entry fee about S$12 per person. After Fort Goryokaku, we drove about 2.5 hours to Lake Toya via toll highway ($55 toll fee). The drive was smooth and stress free. Arrived at Hotel Grand Toya around 5pm, just in time for dinner. Fortunately we booked a Japanese room, and was assigned an absolute lake front facing room. One thing to note, the street restaurants at Lake Toya closed in the morning. Good luck to those who did not book hotel breakfast. Restaurants at Lake Toya usually opened at 6pm for dinner. We randomly walked into one of the street ramen restaurants. 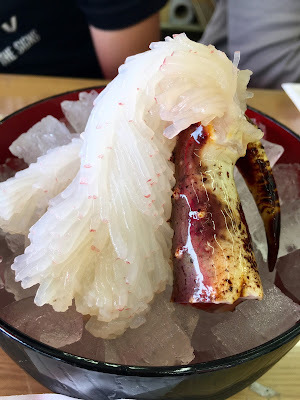 Price was standard (850yen to 1150yen), and quality consistently good. When the night fall, we strolled along the lake and stopped at an outdoor public hot spring to enjoy hot foot bath while waiting for 8.45pm fire work. The fire works was fired from a moving boat and lasted more than 10 minutes. Besides watching the fire works from lake front, you can watch it from moving ferry (chargeable). Lake Toya was one of our most memorable stay in Hokkaido. After breakfast, we check-out the hotel and head straight to Sobetsu Fruit Farm. It took 15 minutes to get there by car. Entry fee approximately $12 per person. You are free to eat all the fruits you desired, any takeaway would be chargeable. The fruits farm had a great variety of grapes, apples, peaches and pears. They were fresh, juicy and sweet. Tools and basket were provided. After fruits diet lunch, we drove 50 minutes to Date Jidaimura, an Edo Period Japanese Theme Park. Free parking but entrance fee quite expensive, about $40 per adult. The most fun station of all was the magic ninja house. In the house, you need to walk pass obstacles, tilted room with mirrors and fake doors (to confuse intruders). Did not really enjoy this theme park as all performance and illustrations were in Japanese. Did not stay too long in the Theme Park, as the size was relatively small. The whole tour was finished within an hour. If you understand Japanese, you might enjoy more. We decided to have our late lunch in the Theme Park before heading off to our next destination. As usual, we tried the deserts and ramen. Standard was ok and prices were reasonable. After late lunch at Date Jidaimura, we drove 10 minutes to Hell Valley. Free entry to Hell Valley but parking was chargeable. Two sites to visit at Hell Valley: the base and mountain top. Visitors were allowed to drive up the mountain top. Parking fee valid for 2 sites. The Hell Valley was very similar to Rotorua in New Zealand. Strangely, Hell Valley did not smell as stink as Rotorua. After being poisoned by the steam and smell, we drove about 3 hours to New Furano Prince Hotel. Arrived quite late, just in time for dinner. New Furoano Hotel was built like a self-contained holiday resort. Facilities include hot spring, walking trails, golf course, hot air balloon and many other adventurous activities. Romantic ambient at night, brightened by light bulbs all over the paths. The Japanese buffet breakfast at the hotel was awesome. After breakfast, we walked the surrounding trails before driving off to the next destination. First stop on the 4th day of road trip was Farm Tomita, a 30 minutes drive from New Furano Prince Hotel. On the way there, we saw rows of colorful lavender sprouting uniformly over a public park. We stopover for photo shoot. Free parking. Free parking and entrance to Farm Tomita. The farm was created by a group of like-minded young farmers, with the objective of boosting visitors rate in the areas. You only get to see these colorful lavenders during autumn period. The farm had an ice cream stall and gift shop. Lunch can be purchased at the food kiosks located outside the farm. Mainly western cuisine such as fried chicken and burgers. 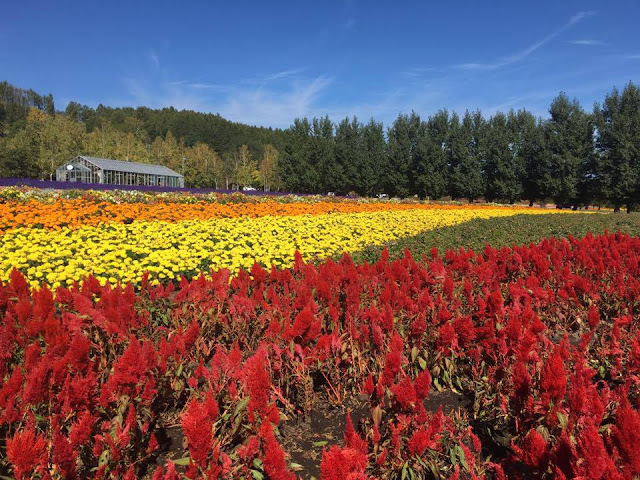 Tomita Farm should be included in MUST visit list if you plan to visit Hokkaido during autumn period. Next stop, the infamous Blue Pond, about 30 minutes drive from Farm Tormita. In reality, the pond was relatively small compared to the photo we saw. Did not take us long to finish walking the trails. Free entry and parking. After Blue Pond, we drove 5 minutes to a nearby waterfall. Parked at the public car park located just at the front of a hotel. Free parking. Decided to call it a day. Drove 45 minutes to Asahikawa Grand Hotel. The hotel charged $14 per day parking fee. Got ourselves refreshed and drive straight to the Asahikawa Ramen Village for dinner. Asahikawa Ramen Village was popular among locals and tourists. Too many choices, all restaurants claimed to serve the best ramen. We chose the one that won Top Choice Restaurant in 2016 and operates since 1946. After dinner, we went to the surrounding malls and supermarkets for shopping. UNIQLO at Asahikawa was located just next to the Ramen Village. It carried mainly winter clothing for coming winter season. Prices were similar compared to UNIQLO Singapore. A supermarket was located nearby, good opportunity to shop for Japanese snacks. Kitahiroshima Mitsui Outlet Park at Sapporo was located 3.3hrs drive from Asahikawa Grand Hotel. A factory outlet that sell branded goods. We decided to set off immediately after breakfast. Shop and eat, nothing else! After shopping and food at Kitahiroshima Mitsui Outlet Park Sapporo, we drove another 50 minutes to Hotel Shikanoyu at Jozankei. From the hotel, we took a 5 minutes trail walk to the Jozankei Futami Suspension Bridge, and spend another 30 minutes walking the trails along the river bank. Besides Jozankei Futami Suspension Bridge, we visited the temple of multiple Budda, hot springs, lake and garden. 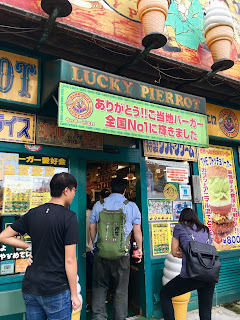 Most places of interest were walking distance from one another, except the Sapporo lake that required 10 minutes drive. Tired after a long walk, just relax at the public hot springs located along the way. After breakfast, we check-out the hotel and drove 50 minutes to Shiroi Koibito Park. The infamous chocolate factory. Free parking and entry into the White Lover Park. Factory tour chargeable at about $8 per person. White Lover Park resembled the western Disney version of chocolate factory. Visitors can purchase freshly made chocolate cookies. Prices were similar to those selling elsewhere. The factory tour was quite interesting. Visitors walked through the guided path and watch the factory at work via see through windows along the walking path. A cafe that sell ice cream, cakes, cookies and coffee welcome you at the end of the tour. We decided to chill up with a chocolate ice cream, snow cheesy cake set and a mocha cup cake. After Chocolate Factory, we drove 30 minutes to OTARU for shopping and lunch. Parking was nightmare and expensive. The Shin Nantaru Market and Otaru canal shops were all within walking distance. Most of the gift shops sell glass wares and musical box. Desert shops everywhere. For us, we spent most of our time and money on foods and deserts! How could we miss the signature green tea ice cream? Our last stop on the 6th day of road trip - Sapporo City Centre. Drove about 40 minutes from Sakaimachi Street to Cross Hotel Sapporo, and spent our last 3 nights there. After check-in the hotel, we walked to the infamous Ramen Alley for dinner. Most of the places of interest (Malls, foods & etc) were within walking distance from on another. Not all Ramen stalls were opened that day. We chose the first stall facing the main road, attracted by a poster of Anthony Bourdain. The ramen standard was ok, spoiled by many choices in Singapore. Second day in Sapporo City Centre, we walked to the Central Wholesale Fish Market from our hotel. Quite similar to the Morning Market at Hakodate but relatively small in size. Prices were comparable too. We had too much raw seafood for the past few days, so we decided to skip seafood and went for cooked dishes instead. Well, nothing much to see, just appreciation of the old clock tower that was built in 1878 and became the landmark and watched over the city throughout the century. Odori Park is a long strip of well manicure greenery that cut through the centre of Sapporo CBD. A popular place for locals to chilled up and relax. A strip of sheltered shops that seems to go on and on endlessly. The shops sell all kinds of merchandises and services. Good experience, but you need to have strong legs to complete the tour. After 2 solid days of shopping and food, time to burn some fats. Booked a mountain bike tour at Lake Shikotsu. 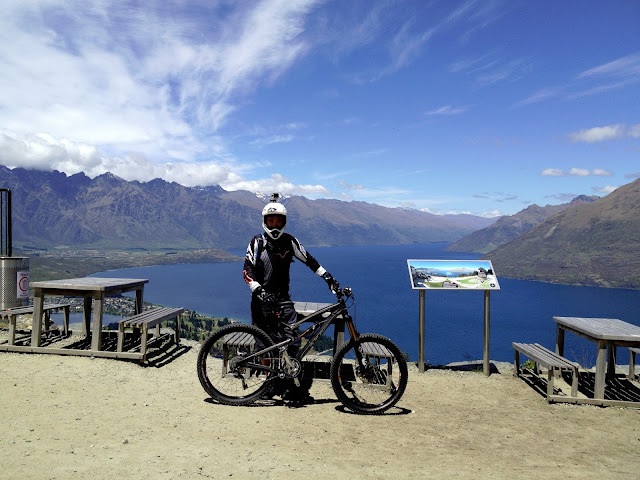 The price was $130 per person, include to/fro transport from hotel, mountain bike rental, helmet and glove. The drive was about 1 hour from Sapporo to Lake Shikotsu. Good value for money. Jun-sen was my ridding buddy and guide. Very experience and steady. 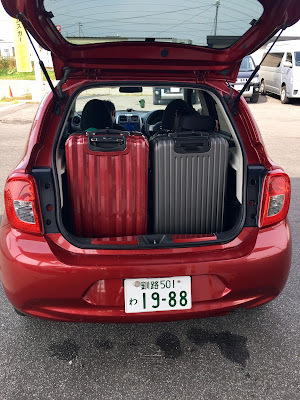 The last day of our road trip, we check-out the hotel in the morning and returned the rental car next to Chitose Airport. Took us about 55 minutes to drive there. We returned the car at 10am, and took a courtesy bus to Chitose Domestic Airport Terminal. We depart at 1pm and arrived at Tokyo Haneda Airport at 2.40pm. 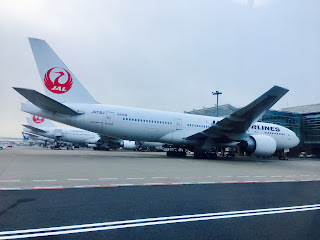 As our flight back home was from Narita Airport, we took a one hour bus ride ($45 per person) from Haneda Airport to Narita Airport. At 6.10pm, we too-off from the airport and landed in Singapore at 12.35am (next day). Thanks, hope it help those who plan to go Hokkaido for a self-drive road trip. may I know how did you request for 4WD for the car rental on Tabirai website? Most of the cars they provide are 4WD. To play safe, send them a message upon confirmation of the booking. You will receive a user ID, PW and URL via your email to access your booking. There is a message option in the booking. Hope it helps. Thank you! May I also know where you parked at while being in Otaru? Parking at Sakaimachi Street is nightmare, as it was congested with people and cars. There was a big open space public car park somewhere along Sakaimachi Street, usually long queue. Parking fee more expensive than other area (Could not remember the price). 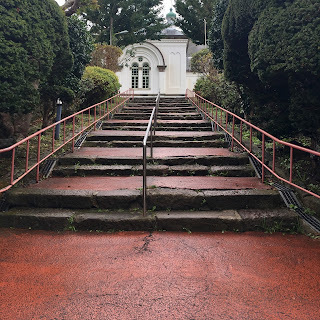 why do you start from hakodate? Sorry for late reply, missed the post. 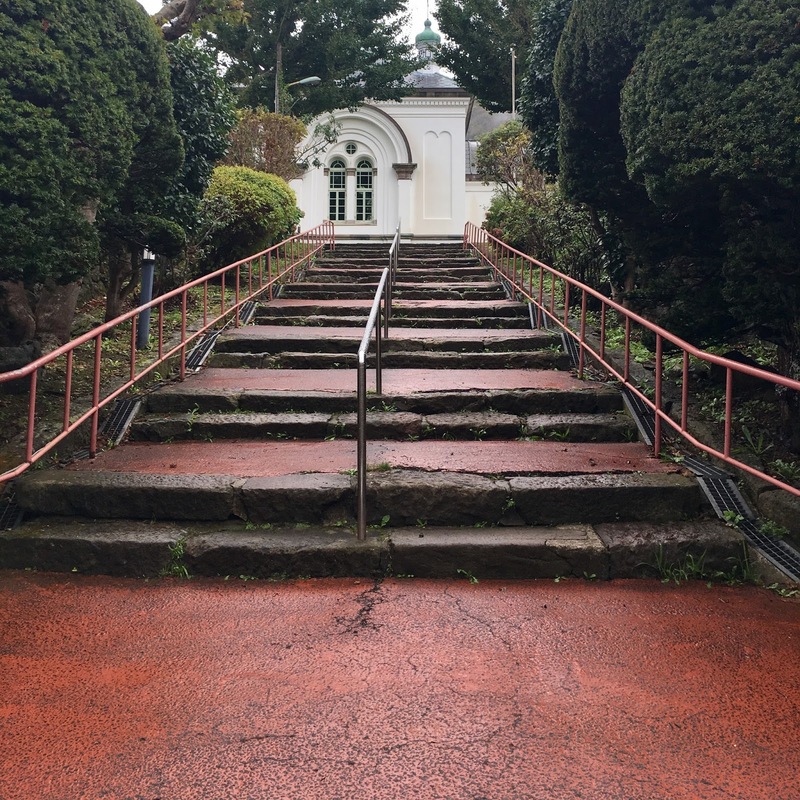 IMO, Hakodate is the best starting point to cover most of Hokkaido tourist destinations on road in the shortest possible time. The flow is more efficient. Thanks! Hope the blog gave you a head start in your traveling plan. We did not drive in Sapporo, as most of the tourist attractions, landmarks and shopping malls are within walking distance. We stayed at Cross Hotel Sapporo, right at the city centre and only 5 minutes walk to JR Sapporo station. We walked to the train stations for shopping and food, not for transport. I don't advise you to drive in Sapporo city centre to get around. Parking will be nightmare and expensive. We park our rental car in the hotel at concession rate. Sorry, could not remember the parking fee. Hi Chris, thanks for sharing your details. 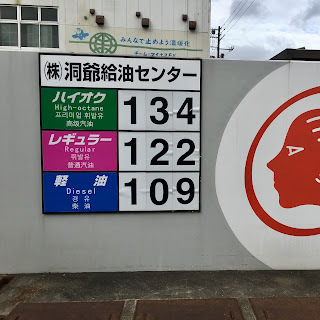 Your blog has set the base for my 10D trip self drive in Hokkaido. Just curious that since you are not driving in Sapporo for the last 3 days, isn't it more cost saving to return the rental car and take JR to airport at last day? At least no need to pay for parking and daily car rental fees. Hi Chris, same question with Janet Lee regarding holding the car for the last 3 days. We start the trip from Hakodate and driving for 4 days before heading to Sapporo area. We have 1 day in Otari, 2 last day in Sapporo. When we reach to Otari should we return the car to avoid parking fee and other costs? We have 2 adults one 10year old and one 5 year old kids. On the last day we need to go to Chitose airport from Sapporo downtown.